Great stuff up and down the Avenue tomorrow. 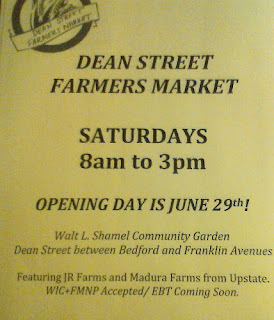 The Dean Street Farmers Market at the Walt L. Shamel Community Garden returns for the summer starting at 8am, and the CHCA clean-up starts at 9am (meet at 737 Franklin Avenue). For the kids, the Brooklyn Children's Museum closes out Caribbean Heritage Month with a Kiddie Carnival (more from them below). 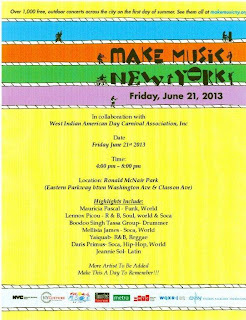 Join us on Saturday, June 29th as we celebrate and close out Caribbean Heritage Month in grand style! Presented by Brooklyn Children’s Museum and produced in partnership with West Indian-American Day Carnival Association (W.I.A.D.C.A. ), the Museum’s third annual Kiddies Caribbean Carnival Fiestafeatures renowned Chef Vanessa Celestine, a steel pan workshop, an all-out kiddies carnival “jump up” and an unveiling of our new “Butterfly” costume (rebuilt by BCM costume maker and seamstress Julia Dotoli) and steel drum instrument (created by Brooklyn’s own Steelpan master - Leri Harrigan) as part of our permanent World Brooklyn exhibition. In addition, as part of our Cultural Connections Series, we’ve added live performances by Bansuri Flute with Sundar Das - traditional Classical Indian ragas subtly influenced by western devotional music (supported by The Tiger Baron Foundation) and The Joy of Indian Dance and Culture - Part of the six day DANCEFEST INDIA! - Delight in the folk and classical dance rhythms of North India as Ayona Bhaduri, former dance resident of the illustrious Nrityagram Dance Village in India, takes you on a fun-filled journey via a live performance and joyful family workshop. (DanceFest INDIA! is made possible in part by funds from the New York State Council on the Arts. Cultural Connections Performance supported by The Tiger Baron Foundation). Visitors are encouraged come dressed in your very own carnival costume regalia! This is one party you won’t want to miss! Due to popular demand we recommend arriving early. All programs are included with Museum admission. 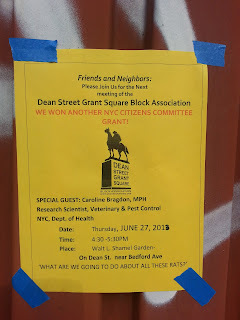 - The Dean Street Grant Square Block Association holds a meeting today with a special guest who will be speaking about rodent control and public health. They'll be meeting in the Walt L. Shamel Community Garden on Dean between Franklin and Bedford at 4:30pm (see flyer picture above for complete details). 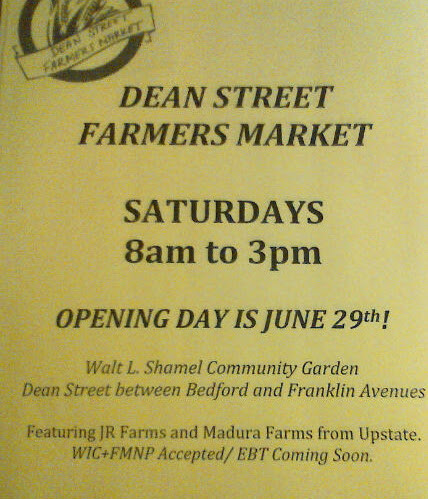 - Seeds in the Middle hosts their Farmers Market at Hamilton-Metz field today from 1-7pm, and they plan to launch their Brower Park market in July. They're also seeking teenage soccer players for July games. 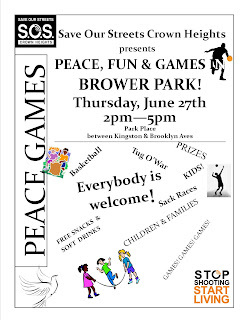 - SOS Crown Heights hosts Peace, Fun, & Games in Brower Park this Thursday from 2-5pm. Complete info below. On Thursday, June 27th, from 2-5pm, Save Our Streets Crown Heights invites you to an afternoon of peace, fun, and games at Brower Park (Park Place between Kingston and Brooklyn Aves). The 2013 Peace Games is an event for Crown Heights families and kids to get together for pure play and laughter. There will be free snacks and soft drinks and games, games, games such as Basketball, Kick Ball, Tug O’ War, and more! Plus, there will be prizes! So please join us and bring the whole family out for a fun summer afternoon in the park. Sign the online petition for more public trash bins and more pick-ups of these bins. Collect petition signatures from your neighbors. Print the petition or pick up blank petitions at HAD Associates, 737 Franklin Ave. Turn in filled-out petitions to HAD Associates by July 7. Or forward this email to neighbors to sign the online petition. Help with the neighborhood trash assessment. Adopt an intersection and collect information about the public trash bins near you. Time commitment is 15 minutes/day and it will require some online data entry. To volunteer, contact Judy at bartlettjudy@gmail.com or 347-706-1824. Join the upcoming clean-up day. Saturday, June 29, 9AM - noon. Meet at 737 Franklin Ave. Distribute flyers for the clean-up day. Print the flyer, post it in on your block or in your building, and distribute to friends and neighbors. Join other volunteers for an hour of flyering and petitioning. 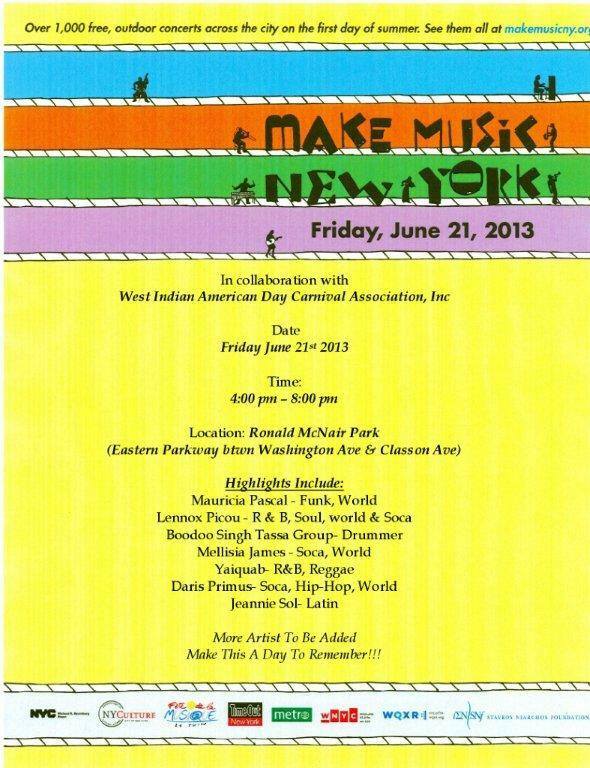 To volunteer, contact Judy at bartlettjudy@gmail.com or 347-706-1824. The petition and neighborhood trash assessment will be part of a package that we are sending to Council Member Tish James. We will thank her for coming to the last Town Hall and for inspiring us to tackle our trash problem. We will also ask for her help in solving our trash problem. Questions? Contact Judy at bartlettjudy@gmail.com or 347-706-1824. - As reported awhile back, the city is installing new maps for pedestrians in several neighborhoods. Crown Heights may have been left out of the first phase of Citibikes, but we are in the pilot program for the maps. LaunchPad invites you to meet our Artist in Residence, Nessa Norich (http://www.nessanorich.com/). Nessa is an actor, director and creator who specializes in unique theater performances. She is currently using LaunchPad to develop "KEEP FOLLOWING" a theater, hip-hop music, and video-art mix that tells the story of a foreigner's first experiences of New York City street life. On June 24 and 25 she'll be hosting theater-making workshops, where she will explain her process for developing unique performances and show you how you can develop your own pieces. "Why is the 'Resistance Rewritten" workshop not happening at Launchpad? Launchpad cancelled our event twenty four hours before it was scheduled The two speakers that were scheduled to give the presentation are radical feminists, and Launchpad fears that giving radical feminists a voice would, in their words, "alter the community's perception of our establishment." In am email to the organizers of this event, they said that they "wish to avoid the controversy." The scheduled presentation has nothing to do with radical feminism at all - it's about historical examples of social justice and environmentalism - but Launchpad believes that censoring radical feminists from speaking on any topic will preserve their public image among those who disagree with feminism." The Deep Green Resistance event that was originally scheduled for this evening (June 23rd) has been cancelled. LaunchPad is a decidedly "un-curated" space that supports local artists and organizers by hosting almost any event that members of the community wish to create. Therefore, LaunchPad is simply a venue for a wide array of (sometimes conflicting) events and beliefs, and it does not endorse specific points of view. LaunchPad's goal is to promote unity within the community and be a space that feels accessible to anyone, and by Saturday afternoon it was clear that this event had triggered a divisive debate. Therefore, rather than risk offending the trans-community we chose to cancel this event. We would prefer to not host an event that could be seen as exclusionary. The central issue is a fundamental disagreement between two sets of beliefs. LaunchPad can not act as a "judge" in these situations, and it is inappropriate to bring the venue into the debate and expect it to render a verdict. LaunchPad instead encourages unity and collaboration through a shared understanding of different and conflicting views. Therefore, we have set aside the evening of August 11th for a healthy discussion on these issues. If representatives from both side of this argument would like to participate, please send a brief e-mail with your info to info@brooklynlaunchpad.org. You can read more from Launchpad and others on their facebook page. Launchpad has found itself at the center of a long-running conflict between radical feminists in Deep Green Resistance and transgender and queer activists. I don't have time to do justice to the nuances of the respective arguments, but I'd encourage those interested to check out DGR's official statement and this article from the movement's founders, as well as these critiques from transgender activists. At its root, the conflict stems from divergent views of how gender is socially constructed. DGR activists argue that gender roles cannot be disassociated from patriarchy and that there is no choice (and a lot of violence) involved in a person's position within the binary gender hierarchy. Transgender activists argue that gender can be fluid and that individuals have a right to realize the gender identities they feel or choose. On the ground, this creates significant clashes, with each group accusing the other of supporting and legitimating the ongoing violence against both women and transgender people (they've also teed off on one another at left-wing events and conferences). Launchpad received many complaints from local folks arguing that their hosting of DGR constituted support for transphobia, while DGR asserts that the cancelation amounts to support for the patriarchy and perpetuates the silencing of radical female voices. Readers, your thoughts? While it seems unlikely that the radical feminists of DGR and local transgender activists will share the stage at Launchpad in August, I, for one, wish that they would. While I sincerely doubt that the ideological gulf between these groups can be bridged, the continued violence against women and transgendered people (neither of whom occupy the "top of the totem pole" in the gender hierarchy that's reserved for straight men) demands a strategic alliance. - Seeds in the Middle is hosting their weekly Thursday Farmers' Market, which takes place from 1-7pm at Hamilton-Metz Field, as I type this. They're also planning to launch a Brower Park Farmers' Market on Fridays starting in July. - Make Music NY kicks off the first day of summer tomorrow (Friday) with free concerts across the city. Here in Crown Heights, you can see a great range of music. Click the flyers above for more details, check out the complete Crown Heights listings here, or check in with Secondary Sound and WIADCA, which are both hosting nearby events, for more details. "Silver Door" brings a new level of immersion to the standard template of our interdisciplinary shows. We will bring the usual variety of art forms together in a more cohesive way and encourage audience participation to a greater extent. The show will include poetry, dance, music, story-telling, burlesque, and other special surprises. We're hosting 10 hours of performances by a diverse group of musicians that's indicative of the Prospect Heights/Crown Heights neighborhood: genuinely uncool but unironically fun! With performers ranging from a man who raps the words of William Shakespeare to experimental solo artists who rock-out on delay pedals to the self-explanatory Toys and Tiny Instruments band. All culminating with the opening of "Give Me a Sign" a new installation/event that explores body language and the traces of human presence through performance, sculpture, painting and collage. Give me a Sign explores body language and the traces of human presence through performance, sculpture, painting and collage. Popsickle is Brooklyn's literary arts festival. Now in its fourth year, the fest aims to unite Brooklyn's array of reading series and mags into one day-long literary megareading. It's happening this year at LaunchPad. Come for some of it, stay for all of it. 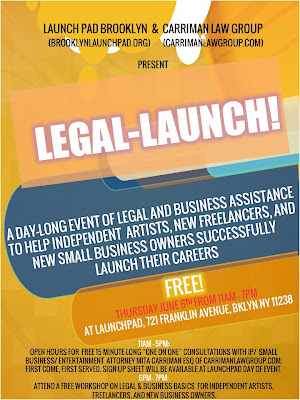 LaunchPad is located at 721 Franklin Avenue, near the 2, 3, 4, 5 and S trains. PERFORMERS INCLUDE: Michael Robbins | Anthony Madrid | Paige Ackerson-Kiely | Dolan Morgan | Danniel Schoonebeek | Coriel Gaffney | Ben Nadler | Julia Guez | Rangi McNeil | Montana Ray | Jarrod Shanahan | Andy Gittlitz | Nicole Steinberg | Paul Simundich | Allyson Paty | Jacob Perkins | JD Scott | Christine Kanownik | Sasha Fletcher | Seth Oelbaum | Ana Božičević | Leigh Stein | Jennifer Tamayo | Ryan Strong | Hubert Vigilla | Carole Nicksin | Anna Moschovakis | Sarah V. Schweig | Elizabeth Zuba | Marisa Crawford & Becca Klaver & Lily Ladewig & Caolan Madden & Emily Skillings & Jennifer Tamayo | & more tba . . . .
Popsickle 2013 is coordinated by Niina Pollari and JD Scott. - Looking ahead to Monday, local folk duo Mark Rogers and Mary Byrne are playing at The Way Station. 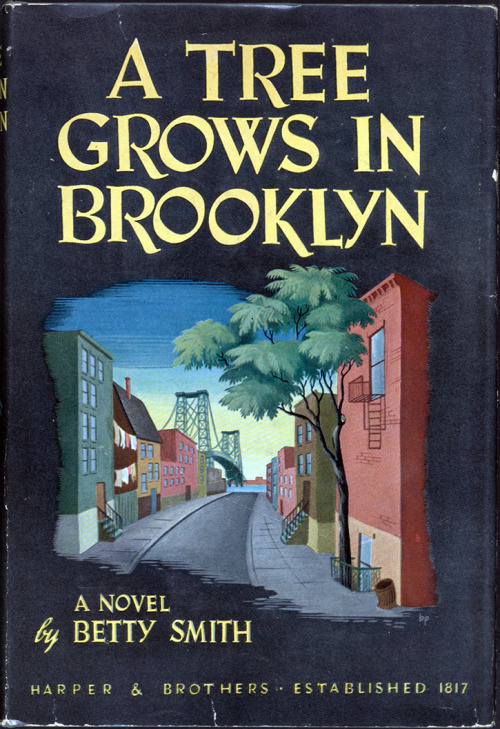 - Long-form journalism site BKLYNR has a tremendous piece up about the efforts of Crown Heights native Milton Beame to host a 72nd reunion for his elementary school class from PS 167 on Eastern Parkway. - Chavela's gets a nice shoutout from Brooklyn Magazine for having an excellent "food-focused happy hour," though describing them as a "Fort Greene Mexican" place isn't so much gentrification-by-rebranding as just plain wrong. Perhaps they're getting their info from Halstead Properties, which lists a ludicrous number of Brooklyn restaurants in many neighborhoods on its Fort Greene info page (thanks to Penina for this amusing tip). - Students from KIPP AMP in Crown Heights are competing in the Middle School Nation Debate Tournament this week in Alabama. 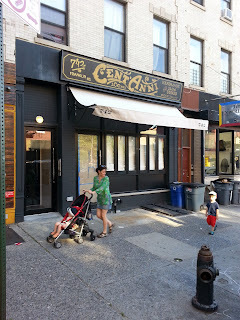 Two for Tuesday: the Crow Hill Community Association hosts their last meeting before their summer break, and Save Our Streets Crown Heights responds to Sunday's shooting. Two worthy events to attend if you're in the neighborhood. The CHCA meeting will be an excellent place to learn about all of the new working groups on Franklin Avenue, including those who hosted the "free cookies and friends" event for Father's Day at Lily & Fig on Sunday and those who are putting a petition together to improve sanitation collection and add more garbage cans to the Avenue. 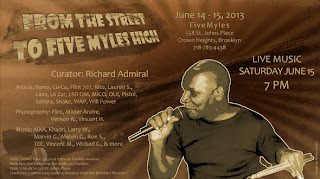 - Five Myles presents "From the Street to Five Myles High" as part of its Summer SpaceProgram tonight and tomorrow night. This weekend exhibition shows contemporary art works done by eight well-known New York City street artists from the seventies and early eighties. The FiveMyles SpaceProgram is in part supported by Public Funds from the New York City Dept. of Cultural Affairs in partnership with the City Council and by the Kevin Noblet Family. - The Crown Heights Assembly are holding their monthly meeting, focused on housing justice, at Georgia's Place (Prospect and Bedford) at 2pm on Saturday. Exit Strata Presents "Exhibit A: Re/Production"
- It's not in Crown Heights, but a bandmate from high school jazz band has his own trio now, and they'll be rocking out at the Metropolitan Room on Saturday night. Check 'em out. - The Daily News has been on the Crown Heights beat lately. Their "Eating Along the 4 Train" series has included rundowns of both Franklin (shout-outs for TasteBuds, Little Zelda, and Rosco's) and Utica. They also ran a nice interview with Penina Roth of the Franklin Park Reading Series. 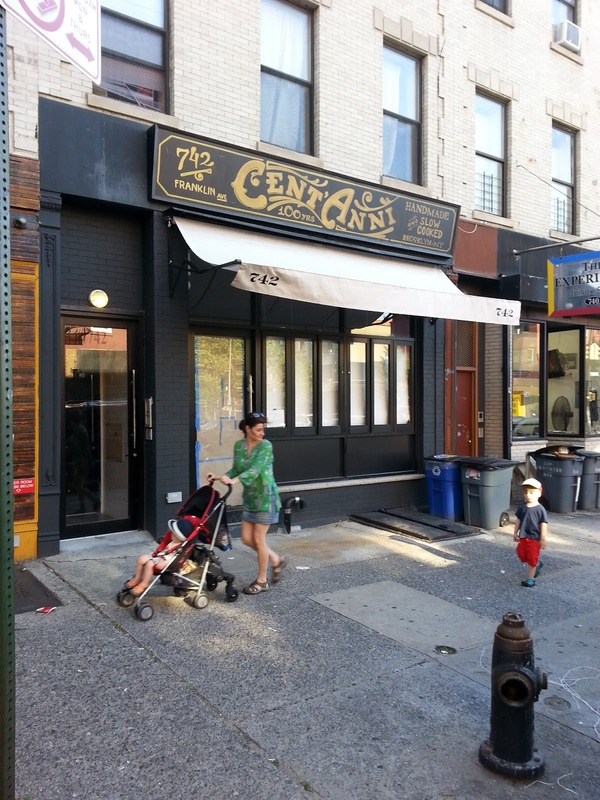 - The Patch folks have been on their game, too, liveblogging the CB8 meeting (who gets liquor licenses being a point of contention and interest) and reporting on the latest literary success to emerge from the neighborhood. - Finally, in deeply troubling news, a pair of attacks on young girls rattled the neighborhood's Chabad Lubuvitch community last week (and should rattle all of us, of course). Investigations are underway. 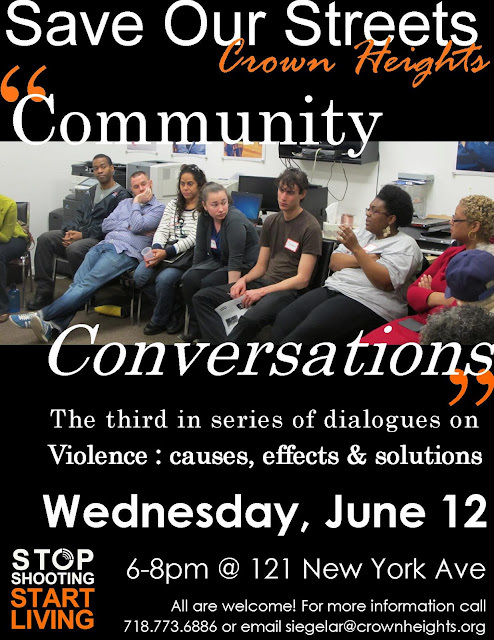 - On Wednesday (tomorrow), join Save Our Streets Crown Heights for the third installment of their "community conversations" series, "Taking Action." Complete information is on the flyer above. - Also, the Livable Neighborhood Working Group formed at the most recent Crow Hill Town Hall Meeting will be out on Franklin tomorrow evening conducting a neighborhood trash assessment and gathering signatures for a petition to bring more garbage cans to Franklin. Give them a shout when you see them if you want to get involved, or hit reply to this thread. - In the slightly-more-distant future, the Crown Heights Assembly meets this Saturday, June 15, to continue their work for housing justice in the neighborhood. This month we're teaming up with the PEN American Center for a showcase of PEN members' work. We're thrilled to present the internationally acclaimed author and humanitarian EDWIDGE DANTICAT (Create Dangerously, Brother, I'm Dying), one of today's leading lit innovators, MATT BELL (In the House upon the Dirt between the Lake and the Woods), and the widely hailed debut novelists AMY BRILL (The Movement of Stars) and MATTHEW AARON GOODMAN (Hold Love Strong). EDWIDGE DANTICAT is the highly acclaimed author of numerous fiction and nonfiction books, including Create Dangerously: The Immigrant Artist at Work, Brother, I’m Dying, The Dew Breaker, The Farming of Bones, Krik? Krak!, and Breath, Eyes, Memory. She is a winner of the National Book Critics Circle Award, The Story Prize, the American Book Award, and the Dayton Literary Peace Prize and a finalist for the National Book Award and the PEN/Faulkner Award. A recipient of a MacArthur Fellowship, she lives in Miami. Her latest novel, Claire of the Sea Light, will be released in August. MATT BELL is the author of the novel In the House Upon the Dirt Between the Lake and the Woods, the novella Cataclysm Baby and the story collection How They Were Found. His fiction has been anthologized in Best American Mystery Stories 2010, Best American Fantasy 2, and 30 Under 30: An Anthology of Innovative Fiction by Younger Writers and shortlisted in Best American Short Stories 2010 and the Pushcart Prize anthology. He serves as Senior Editor at Dzanc Books, where he runs the literary magazine The Collagist, and teaches writing at the University of Michigan in Ann Arbor. AMY BRILL is the author of the novel The Movement of Stars. Her articles, essays, and short stories have appeared in many publications, including Salon, Guernica, and Time Out New York, and have been anthologized in Before and After: Stories from New York and Lost and Found. A Pushcart Prize nominee, she has been awarded fellowships in fiction by the Edward Albee Foundation , the Millay Colony, and the American Antiquarian Society, among others. As a broadcast journalist and producer, she has worked for PBS and MTV and she is the recipient of a George Foster Peabody Award. She lives in Brooklyn. MATTHEW AARON GOODMAN is the author of the novel Hold Love Strong, which was chosen by Barnes and Noble as a “Discover Great New Writers Book” and by USA Today as a “New Voices Pick.” He teaches Multicultural American Literature at Hunter College, serves as the Curator of the Museum of Natural Historicity, and is the Editor-in-Chief of The Phenomenal Nobodies. He is also the Coordinator of The New York Juvenile Justice Initiative.. He lives in Brooklyn. PEN American Center, the U.S. branch of the world’s oldest international literary and human rights organization, is an association of writers working to advance literature, defend free expression, and foster international literary fellowship. Learn more: http://www.pen.org/. - Clearing out a long abandoned lot … perhaps to grow into a new garden? Meet at the Roger That on the corner of Rogers Ave and Park Place. Bring gloves and we’ll bring the rest. A day-long event of free legal and business assistance to help independent artists, new freelancers, and new small business owners successfully launch their careers. 15 minute-long one-on-one consultations from noon - 5pm, and a workshop/presentation from 6pm-7pm. This month’s installment features Jefferson, a self-described “parent and pervert” who runs the Bare! and Spill! storytelling series in New York City, Boston and Washington, D.C. (Listen to his heartbreaking account of spending Christmas with his ex-wife on the Risk! podcast.) Please join us for tales of drinking and debauchery — and throw your name in the cocktail shaker for the chance to tell your own! Every first Thursday of the month, Another Round Storytelling serves up a new batch of stories in which alcohol is the star, or at least plays a supporting role. Five people are randomly chosen and receive 10 minutes to tell a booze-soaked tale. Then a special guest headliner takes the stage to close out the show. :: Dominoes at Ivette's Written by Marvin Camillo Valentine Jr.
:::::::::: Throw Down (Monologue) Written by Marvin F. Camillo Sr.
Taylor Watkins (27) is a cancer survivor fighting a second round with this monstrous disease. He’s a hugely talented ceramic artist with a big heart. Taylor was diagnosed with a rare and very aggressive form of cancer. He doesn’t have health insurance and needs all of our support to beat this thing. Come help raise money for Taylor’s treatment, and send healing energy, strength, and the fight of 10,000 lions!! Yesterday, I was thrilled to share the news that SOS Crown Heights had gone 93 days without a shooting in their catchment area, which stretches from Kingston west to Utica and Eastern Parkway north to Atlantic. While many factors no doubt contributed to three months without shootings, the SOS folks deserve an immense amount of praise for their community-based anti-violence work. Unfortunately, there was a fatal shooting in Crown Heights on Sunday, June 2nd on Bergen street and Albany avenue. We are very saddened by this event as we were approaching 100 days without a shooting. Please join us for a shooting response tomorrow, June 4th at 6pm on Bergen street and Albany Avenue. Only together as a community can we continue the difficult work of ending gun violence. Arts to End Violence presents our first ever open-mic spoken word event "Speak Your PEACE!" We are looking for voices from the community to share words about violence and how we can work against it. All submissions/entrants are welcome-- email Marlon Peterson at mpeterson@crownheights.org if you want to participate. 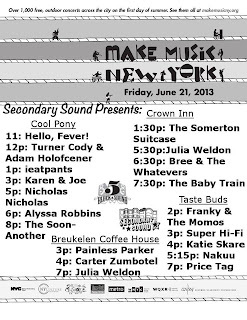 If you're not a wordsmith yourself, come hear your neighbors perform! The event will be held from 6:30-9pm this Wednesday, June 5th, at 1156 St. Johns Place, between Kingston and Albany Avenues. 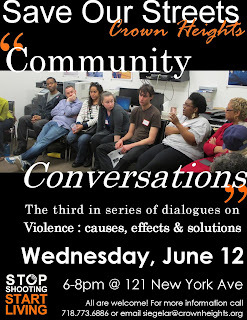 Arts to End Violence is an initiative of the Crown Heights Community Mediation Center, home of Save Our Streets Crown Heights-- a grassroots anti-violence initiative. Previous Arts to End Violence events included the Kingston Avenue Festival block party and a gallery opening featuring anti-violence art. This time we're using our words: what do you have to say about gun violence? Speak your PEACE! Also, following the Speak Your PEACE event all will have a guided tour of our Arts To End Violence art gallery located on the same block. A live deejay will be on hand and refreshments will be served. - Additionally, as posted last week, all six candidates for City Council in the 35th District will be appearing at a candidates forum on Wednesday from 7-9pm at PS 9 on Underhill Avenue between St. Marks and Bergen. You can submit questions online at the link above. There are a lot of challenges facing Crown Heights - let's hear what our prospective City Councilors have to say about them. Thanks to the Crow Hill Community Association, Crown Heights North Association and the Prospect Heights Neighborhood Development Council for hosting.